Delighted to report that there was no rain in Oban! It rained for a while during the train ride, but even that fizzled out and for one brief, shining moment or two on our journey the sun threatened to come out, and a patch or two of blue appeared fleetingly in the sky. I’ll write about Oban itself in a moment, but it was the journey TO Oban that was the real lure for me, one of the finest train journeys, it has been called, through Scotland. And it did not disappoint, although I couldn’t help but imagine it on a sunny day. The journey takes you up and up into the highlands, gradually. At one point in the journey I realized that we were climbing, primarily by looking down and seeing how small the waterfront villages were becoming as we chugged along, but even as we gained height there were always higher peaks and ranges in the distance. 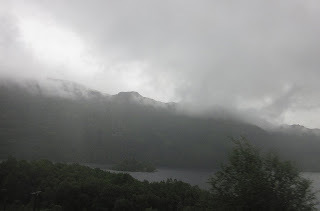 The names of the places we stopped at were very Scottish: Crianlarich, Garelochhead, Ardlui; and some highly evocative: Loch Awe (which WAS awesome) and my favorite, The Falls of Cruachan. 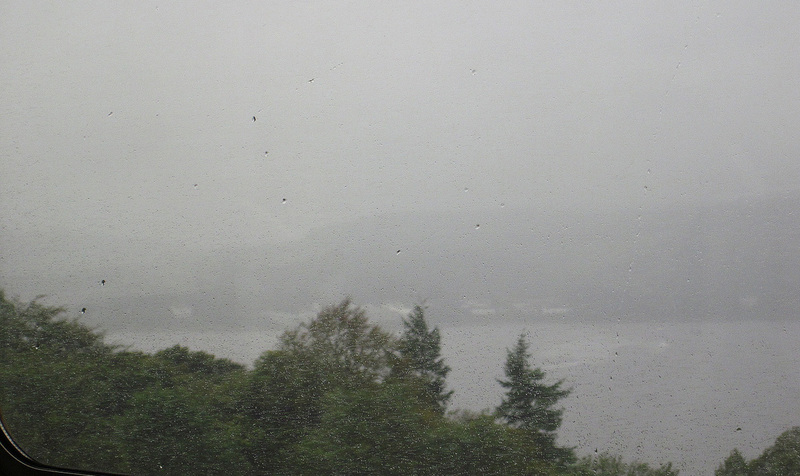 I imagined it the setting for another in the immensely popular film series: Harry Potter and The Falls of Cruachan. Perhaps I’ll get in touch with J.K. and offer to collaborate. 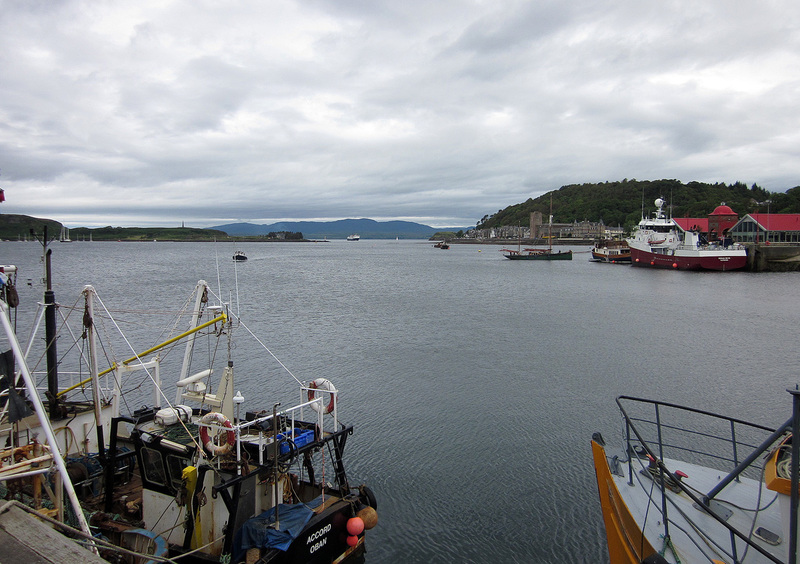 And then we began to head downward, to the sea, to the dramatic area where Oban is located. 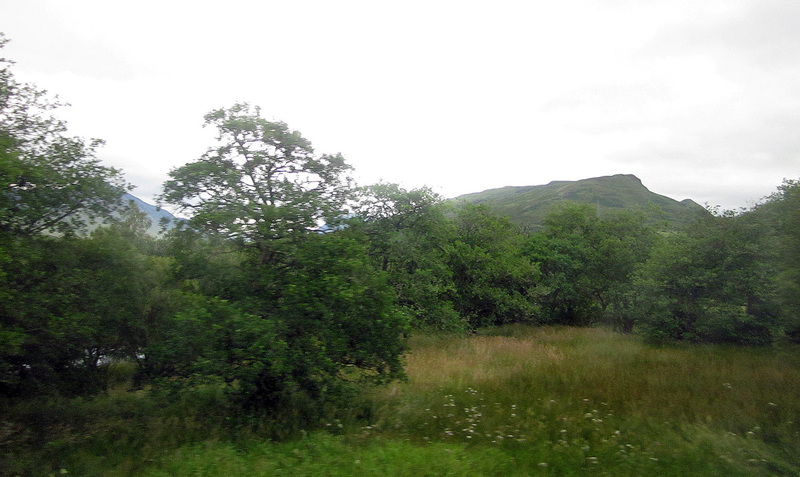 As we moved toward Oban we saw more and more of the Western Highlands. The first part of the journey was shrouded in mist, but not that of the Brigadoon variety: “The mist of May is in the gloamin’ and all the clouds are holdin’ still, so take my hand and let’s go roamin’ to the heather on the hill…” No, this mist was dark, heavy, thick, almost ominous. I imagined that when (or if) it ever lifted, I and my six brave-hearted companions would see coming out of the mist at us an army of huge, hirsute Scots brandishing axes and deadly short swords. But when it actually lifted, though it never lifted completely, the army was replaced by a series of startling vistas, mountain lakes and streams, grazing sheep, horses and cattle, and farms whose owners I imagined to be very tough indeed, perhaps the descendents of my fantasy warriors. The landscape grew more and more beautiful, mind you in a rugged, west-highland-ish way. Almost immediately upon my arrival in Oban, I realized that while it was a charming seaside village, there would be little to keep me for six full hours without having a place to get shelter from the always threatening storm, to get a rest and a second wind. So I opted for the only other train out that day, one that would give me the better part of two hours to hike around, but that would not trap me (as I had been in Conwy North Wales) in a train station for two hours after I’d exhausted myself. Having made that decision I leapt into what for me passes as action. 1. Get WHISKEY! For Johnny Kontogiannis, who is kindly taking care of my Corolla for me while I’m out of the U.S. Not for myself, it should go without saying…ahem! 2. Get LOCAL SEAFOOD! I discovered that in addition to distilling an excellent single malt scotch, Oban is the seafood capital of Scotland, at least it has adopted that title. 3. Get a LOOK at the village! 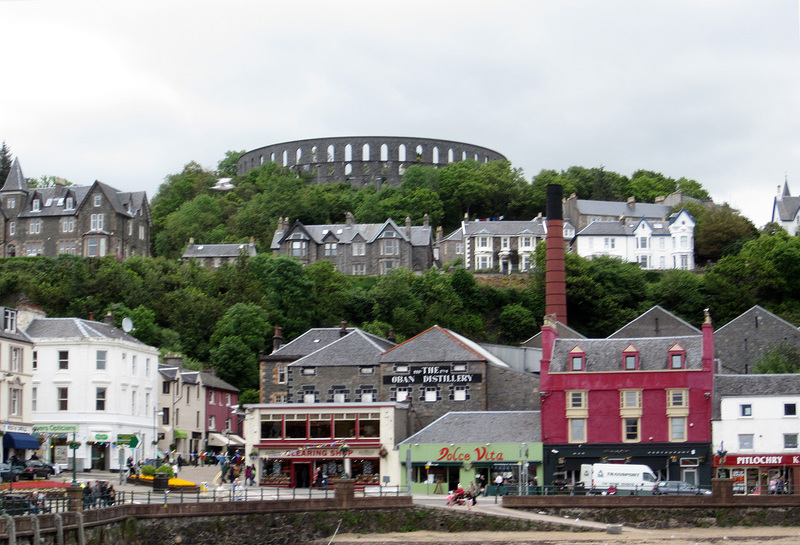 Oban sits on the sea, with several islands nearby, and is said to be very picturesque. After grabbing a map from the tourist centre (always make that your first stop if you don’t want to waste valuable time) I immediately launched myself on my first quest. 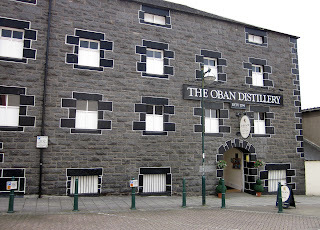 The Oban distillery is easily found, an imposing gray building just off the main drag, George Street. I had wanted to take the tour, but knew that that would take nearly an hour itself, so passed on that, visited the shop, and…well, let’s just say that I do believe Johnny will be pleased, as I found him a special scotch sold only at the distillery. Task number one easily and quickly, if a tad expensively done. I then sought out a spot to satisfy my second quest. 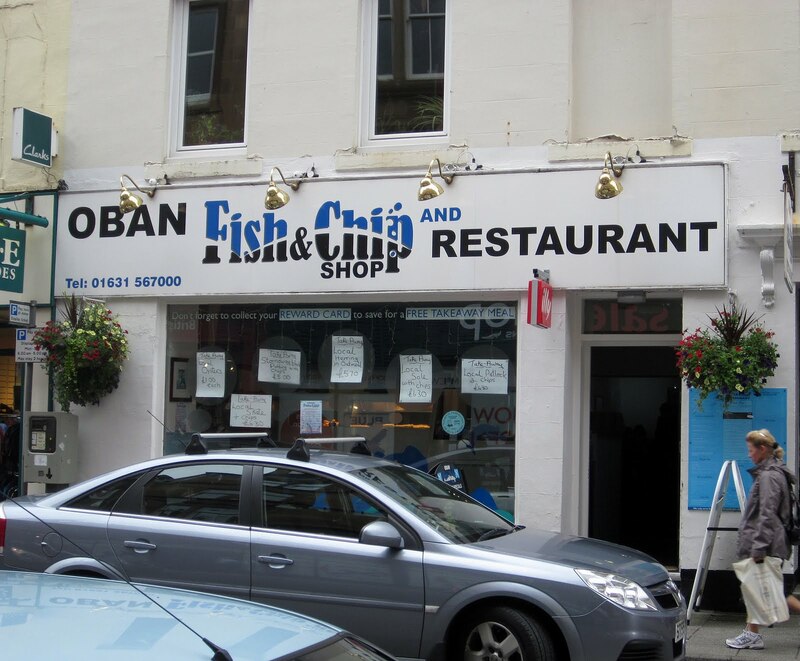 There are many seafood restaurants in Oban, each advertising excellent local fish and shellfish. 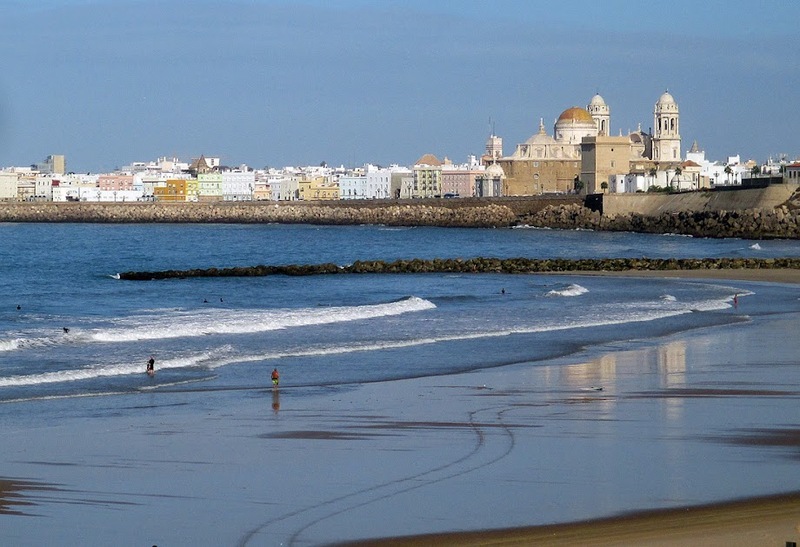 I knew that sitting down in a nice seaside place would be time-consuming and expensive. I’d already shot my monetary wad for the day on task number one. It happened that just down the street from the distillery there sits a fish ‘n’ chips place advertising not only local sole and chips, but also local slate and chips and even more curiously for me, local pollock and chips, all of the above for £6.30 each in addition to local herring in oatmeal for £5.30 and local oysters for £1 each. In addition a mystery meal was listed: stornaway black pudding and chips. Knowing a bit about black pudding I decided to pass on that one. Granted that my cholesterol level rose precipitously the moment I crossed the threshold, I was also greeted in a warm manner by a middle aged woman who explained the fine points of difference between the choices on the menu. 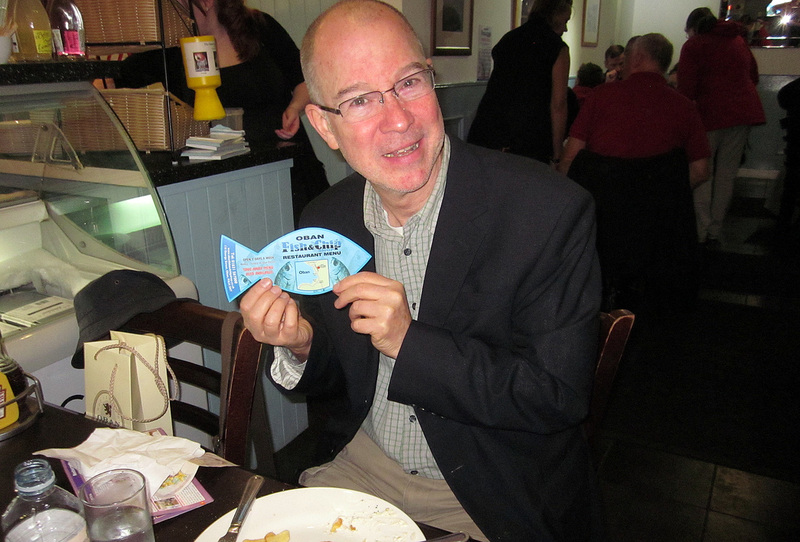 I opted for the pollock, as I’d never had it and because she described it, contrasting it with sole (a delicate, light fish) as a hearty, meaty fish. I was not disappointed. Have you had fish ‘n’ chips at which you find yourself digging three quarters of the meal for any fish at all, buried in batter? I have, but not so pollock! It was very fresh, as advertised, and really filled the interior of a tasty batter. The chips I’ll admit were a tad mealy for my taste, but the fish itself was perhaps the best fish ‘n’ chips I’d ever tasted. The solicitous woman also brought me a small bowl of her homemade sauce, which was every bit as good as the fish. To back-pedal slightly, when I sat down to wait for the fish to arrive (I could have taken it out wrapped in paper, the traditional way to eat this…I was going to use the word “dish” but that would not be appropriate…meal) the man sitting next to me greeted me in a friendly manner and asked where I was from. We spoke for a bit, and I asked him if he were a local – in fact he was not only local, he was the owner of the establishment, and he introduced himself and his wife (the solicitous woman who described the fish and who served me). We chatted on a bit, he stressing that there was no recession in Oban. Though I’d seen three different stores in town posting closing sale notices, there was certainly no recession in his shop, which was packed with those who dined in and those who took out. It waa an altogether pleasant and time-efficient experience. Task number two complete! Dottore Gianni piace "fish e chips!" As for task number three, I got a good look around this charming if somewhat tourist-ridden place. 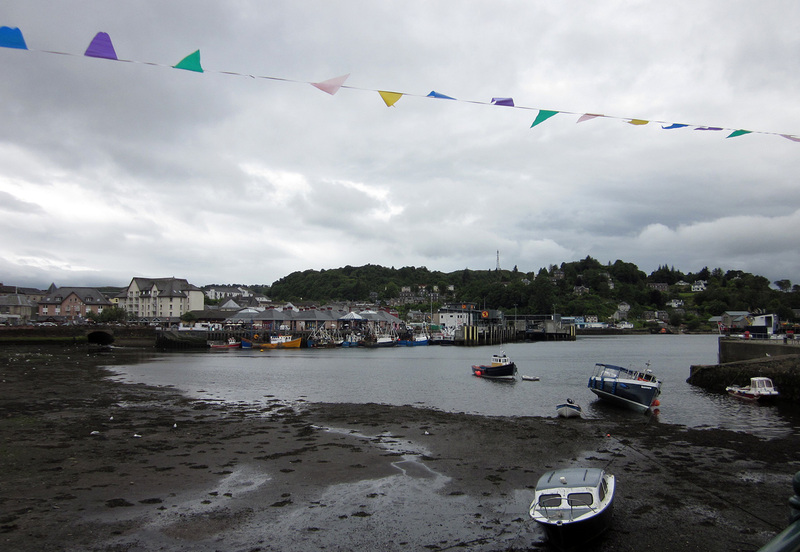 Oban boasts a charming waterfront area, though when I arrived the tide was out, revealing a bit of a mess of a dark stony beach, that I’m sure is more tourist-friendly when the tide is in. The houses in the village seemed to me to rise as if in an amphitheatre round the seafront, culminating in what looked at first to be a extremely well preserved ancient Roman temple. It was in fact a late nineteenth century monument to one wealthy man, John Stuart McCaig, and his family. Pretentious? Perhaps, but according to the map of the city I’d picked up, the man apparently began the project because he noted that there were a lot of unhappy, out-of-work men in the village. The pseudo-Roman monument to himself also gave many of them temporary employment. And then I hopped on the train and chugged back to Glasgow. I had accomplished what I set out to do, enjoyed it all, and now relaxed, enjoying views of a now slightly more familiar, but nonetheless dramatic terrain. The weather worsened as we approached Glasgow, the mist thickened to the point that little was visible except the immediate distance, trees and fields speeding past my rain-spattered window. 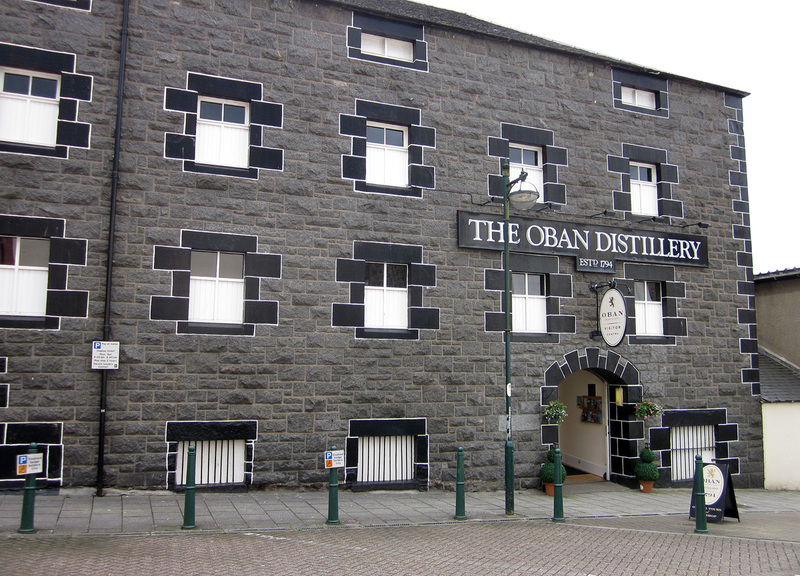 And that is all I have to say of Oban and the trip to and from. More in a day or so, in part 3, as my Highland Fling continues.